Our fully accessible, modern building in Carlisle offers a wide range of facilities including the recently refurbished Community Hall, a Changing Places Toilet, a Commercial Kitchen plus meeting rooms available to hire for conferences, training sessions, workshops or one to ones. The Shaddongate Community Resource Centre offers a variety of competitively priced rooms to meet your requirements from our large community hall to our smallest rooms suitable for one to one meetings. The table below shows examples of popular rooms layouts and the maximum capacity. If you had something different in mind we would be happy to work with you to make your event a success. Our Community Hall is a big modern space on the ground floor, perfect for large meetings or functions for up to 100 people, with a range of flexible configurations helping to make this space work for you. The room can also be hired on an hourly basis for community groups, birthday parties or any type of activity or event that needs a large flexible space. The Community Kitchen is available to hire for groups looking for a commercial standard kitchen fitted with Gas Oven, Hob and Grill, Hot Water Boiler, Dishwasher and Microwave. The kitchen is perfect for cooking with groups, practical learning or could even be used as part of a community kitchen enterprise. Our large training/meeting room offers a variety of options for 20-30 people with an adjoining kitchen/break out area ideal for catering and refreshments during the day. On the first floor the Petteril Room is easily accessed via lift with space for 15-20 people. The room also opens out onto an open plan lobby area which can be used for catering and refreshments as well as networking. The Eden Room is located on the ground floor and is a suitable space for up to 12 people. The meeting room is ideal for interviews, team meetings or training sessions. It can also be used in conjunction with the Community Kitchen for group cooking sessions. We have a range of office space to let on a short or long-term basis. Rents are all-inclusive and rooms are currently available on the ground floor and the first floor. There are communal kitchen areas throughout the building and some offices also offer a built-in sink unit. Please feel free to contact us to discuss your requirements or to arrange coming for a look around the Shaddongate Resource Centre. For further details on any of the above, contact. 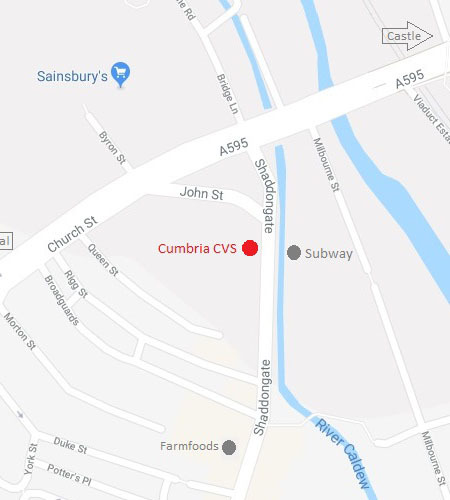 Cumbria CVS also has office space and rooms to hire in Barrow at our Lesser Kings Hall site. Please contact us for further information.